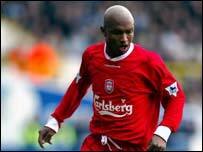 The Liverpool footballer, El Hadji-Diouf, has pleaded not guilty to spitting at a Celtic fan during a Uefa Cup match. The player will now go on trial at Glasgow Sheriff Court on 4 September. The Senegal striker is charged with assaulting Dominic Schiavone during the match at Parkhead in March which ended in a 1-1 draw. He was not in court for Friday's brief hearing.